What Is the Difference Between a Mani & a Pedi? 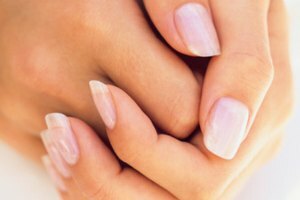 The roots for the word "manicure" are the Latin word for "hand," or manus, and for "care" or "attend to," cura or curare. While "pedicure" shares cura, it replaces manus with ped or pes, meaning "foot." In these roots, you see the obvious difference: Manis, or manicures, are for hands, while pedis, or pedicures, are for feet. While each involves grooming the nails and skin of your appendages, the methods and tools differ slightly. A technician trims and shapes the nails of your toes during a pedicure and your fingers during a manicure. The hands or feet soak -- hands usually in a small bowl and feet in a small tub attached to a chair. Skin softeners and essential oils may be added to the soaking water to soften your skin and the cuticles. A foot or hand massage is often included in the treatment. Usually, the technician buffs your nails, uses an orange stick to push back the excess skin of the cuticles and applies lotion to your skin. She then brushes on a clear base coat, polish of your choice and a top coat. Some pedicures include an exfoliating scrub for your feet and lower legs. Some salons may use a pumice stone or foot file on your heel to soften the tough skin. Although you may get a gentle exfoliating treatment on your hands, it's unlikely your palms will be scrubbed very intensely. You can ask for gel polish on either your toes or feet. This polish, when cured with a UV light, may last as long as two weeks and is incredibly hard. However, it's difficult to remove and will only budge when you use an acetone remover, which can dry your nails and skin. 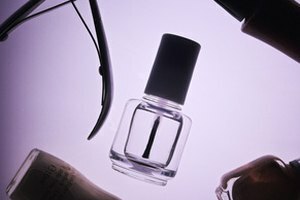 Alternatives to gel are conventional polishes, which tend to chip much sooner. They're easier to remove, though. You may request a classic or spa pedicure or manicure. The specifics of a spa treatment depend on the salon, but you can usually expect the technician to go beyond basic nail care and exfoliation with added details such as aroma therapy and longer massages. These spa versions are usually more expensive than standard procedures. In general, pedicures usually cost 50 to 70 percent more than manicures because they involve more work on the part of the technician and take longer. Salons often offer discounts on the cost of both if you get them done in the same visit.